Decorative tiles are a simple way to add character to a home. Using different tile designs in different rooms helps give those rooms individual uniqueness. 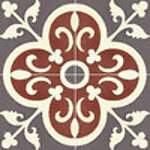 Our selection of Moroccan floor tiles will beautify any home. These Moroccan cement tiles are handmade and were designed for floor as well as wall projects. Each of these Moroccan tiles are also skillfully hand painted in various traditional Moorish designs and colors. Match your choice of Moroccan floor tiles with the many products displayed on our store to complete your Moroccan themed decor.